Is “we’re bored” ringing in your ears? 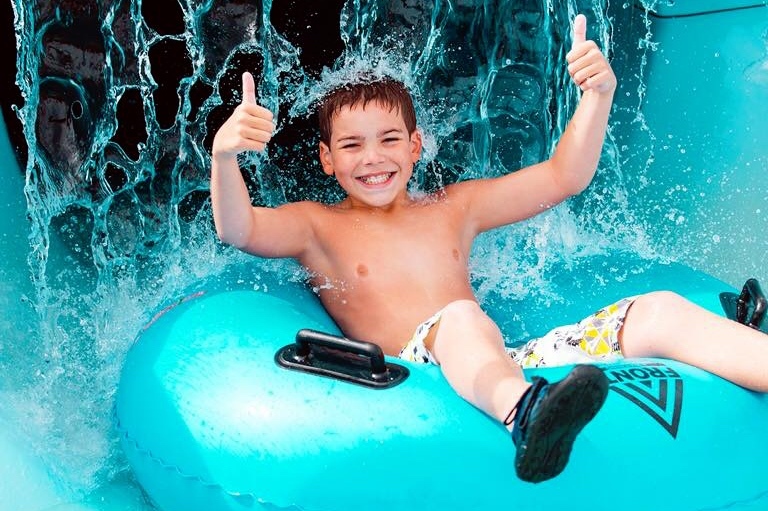 Well, wash that boredom away with one of KidTripster’s top picks for water parks in the Pacific Northwest. All are open during the summer; a few even can be enjoyed on a rainy winter day. 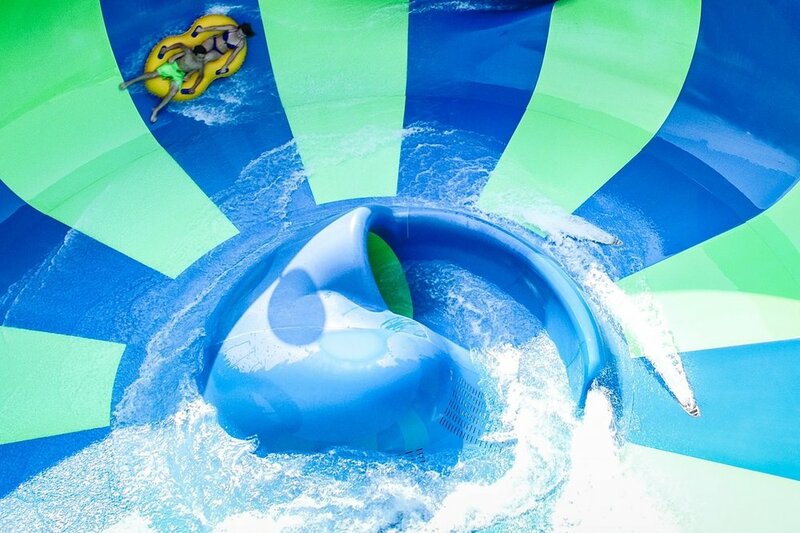 Wild Waves is a sprawling outdoor water park about 40 minutes south of downtown Seattle. Thanks to its size, there’s something for everyone in the family. The kids’ area features tiny slides for toddlers and a huge play structure with different slides coming off in almost every level. There’s a wave pool and a lazy river that you can lay back and relax in. There are a bunch of waterslides, all ridden on inflatables. When you find yourself water-logged, you can head to the Enchanted Village amusement park, which has everything from carousels and train rides to a roller coaster that does a loop and two corkscrews! If you have a preschooler, teen or both, Wild Waves is excellent. The big slides are honestly thrilling, and the second time down is even better than the first. The area for young swimmers and waders is extensive and challenging but not overwhelming. There are plenty of deck chairs by the wave pool and around the little kid area. And if your family needs a place to escape the sun, you can rent a cabana. Wild Waves has been around for decades, and the facilities are “well-loved.” Admission is higher for the water park, because Enchanted Village is included, even if you don’t want to go. If you’re not renting a cabana, the sun can be relentless, and there’s not a lot of shade. Cost: Youth (under 48”) $19.99; Adult $39.99; Family-sized all-day lockers $17 with $5 refund at the end of the day; Cabanas: $150 to $250, depending on weekday or weekend. Wild Waves and Enchanted Village are only open during the summer. 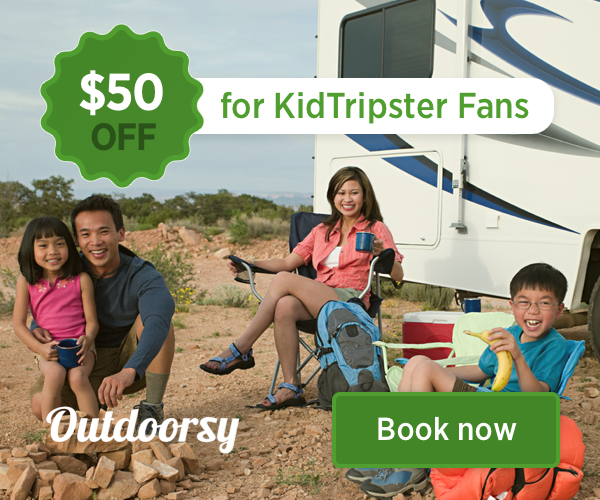 KidTripster Tip: Get your tickets online. You’ll save $12 off each adult ticket and $3 off each kid ticket. You can even buy the tickets while standing in line, and the cashier will read the code off your smartphone. Located south of Portland in Oregon’s wine country, Evergreen Wings & Waves is an exciting and relatively new addition to Evergreen’s incredible aviation museum. The museum is stuffed with airplanes, helicopters, and the one-of-a-kind Spruce Goose, the largest flying boat of all time with the biggest wingspan of any aircraft in history. The surrounding campus is dotted with huge jets, fighter planes, and assorted aviation paraphernalia. And finally, there’s the building with a 747 on the roof; that’s the water park! And you’re gonna slide out of that plane! How cool is it to climb a staircase into the cargo hold of an actual jumbo jet? It’s mind-boggling, but you have to try it for yourself to get the full feel. Four slides drop out of the belly of the 747, including the Mach 1, the coolest body slide in the Northwest (no tube needed). The other three slides offer a range of thrills from the zippy Sonic Boom to the heart-thumping Nose Dive. Above the wave pool, a giant screen quizzes swimmers about water - fun and an education! The now-defunct Evergreen Aviation got its start, in part, by supplying firefighting helicopters. That’s why a helicopter drops a giant bucket of water every few minutes on the splashdown pad by the kids’ play structure, a forest-themed adventure area with three small waterslides and water cannons. Everywhere you look, lifeguards are watching, and you hear the short trill of whistles as they get kids back in line. And it’s all indoors with no worry about sunburn or rain. KidTripster Tip: Don’t wear a swimsuit with metal or hard plastic, if you want to ride the Mach 1 bodyslide. You’ll have two options: take another slide or cut the hard part out. Attendants will even offer you scissors! Evergreen is a small indoor water park, so there’s not a lot of room. The wave pool itself is narrow and rather shallow at 5 feet deep, and with so many kids and parents on inflatable tubes, it fills up quickly. The day that we were there, the cafe was hurting. It was out of several menu items, and most of the napkin dispensers were empty. The dining options here need improvement. Cost: Youth (under 42”) $20; Other (over 42”, although you have to be 48” to ride Mach 1) $33; Dry pass (if you just want to watch) $10; Medium locker $7. The park is open seven days a week in the summer, but only weekends during the rest of the year (plus full time during Christmas break). KidTripster Tip: Check out the museum! It’s incredible to see what aviators have piloted to break free of earth’s grasp. The water park is fun, but maybe hit it second, so you’re not walking around the museum with wet hair. Unfortunately, you have to buy tickets to the neighboring venue separately. Cost: Youth (5-16) $19; Adult $27. One of the closest lodging options is also one of the more unique. The Vintages Trailer Resort features historic travel trailers, painstakingly remodeled as cozy getaways. Some of the trailers fit two adults and two kids. Rates start at $95/night. You already may be familiar with Great Wolf Lodge. It’s the biggest chain of indoor water parks in the country with more than a dozen parks dotting the U.S. The resort has its system dialed in: great slides, the best wave pool around, and a two-tiered play area that makes Great Wolf Lodge a perfect choice for toddlers. The water park is only open for guests of the lodge, so pools are never too crowded. Plus, the rest of the accommodations are a blur of excitement for kids with arcades, pizza joints, ice cream parlors, kiddie spas, and story time with animatronic forest creatures. The water park is focused on three main areas: a huge wave pool that gets deep enough near that back wall to allow even the tallest parents to actually float, a tower with four slides including The Howlin’ Tornado with its colorful drop-in funnel that you can see as you drive by on Interstate 5, and a great kids’ area. This park is made for families with tubes that seat four people for a great shared experience. Your smaller kids can dodge the huge water drop and climb on Fort Mackenzie to access the slides designed for smaller riders. The little toddler pond is perfect for kids just getting their feet wet with the whole water park experience. KidTripster Tip: You can access the water park on both the day you check in and the day you check out. That’s double the fun! Pack a smaller bag, put the rest of your luggage in your car, and wear yourself out. Great Wolf Lodge has plenty of restaurants, so you don’t have to leave; but that convenience isn’t cheap. The whole operation is set up like a Las Vegas for kids, so expect to be a veritable ATM as your kids discover the arcade, magic wands, and glow-in-the-dark mini golf. KidTripster Tip: If you’re looking to save a few bucks, the rooms have microwaves. We brought some frozen mac and cheese and some veggie snacks and saved a bundle. A themed suite with a queen-sized bed for parents and log cabin-inspired bunks for the kids is about $400/night; lockers cost $10. Great Wolf Lodge is open year-round. Sunriver Resort is a great place for families to get away. It’s list of amenities is long: miles of easy bike paths, tennis and basketball courts, miniature golf, river fishing and floating during the summer, and skiing and snowboarding during the winter. It’s been a special getaway for my family for years. SHARC, or the Sunriver Homeowners Aquatic and Recreation Center, is a fairly recent addition to the expansive resort. The little indoor-outdoor jewel has two slides, including a fully-enclosed (and spookily-dark) bodyslide, lazy river, and several pools. It’s small, but it’s a must-do in the middle of a paradise that’s full of other options. SHARC is compact, but there are a lot of places to sit, sunbathe, and hang out. The lazy river float is a tight little circuit, but it’s relaxing. The slides aren’t towering beasts, but they have tight turns and enough back-and-forths to toss a guy like me. The hot tub is great for soothing those muscles you haven’t used in years, and there’s a sandy kid play area with a wading pool to wash off the sand. The cafe has good-looking food options like a salads and wraps to go with the standard chicken strips and fries, and it serves beer and frozen sangrias! Again, SHARC is small. But after swimming in the little pool at our cabin, it seemed spacious. The kids’ area is the least intricate of any of the other parks that I’ve listed here. While not a destination in its own right, SHARC is a welcomed addition to a Sunriver vacation. Cost: Youth (3 and under) Free; Other $25. The outdoor park is open during the summer; the indoor pool is open all year. KidTripster Tip: Try Splashy Hour after 5 p.m. on Central Oregon’s warm summer evenings, when admission is just $13. SHARC closes at 8 p.m., so the kids will get in three solid hours of play. While Sunriver Resort offers lodge rooms, most families take advantage of the large selection of home rentals. Rates vary widely, depending on size and season. A visit to Silverwood and Boulder Beach is a full-on theme and water park experience with all the jaw-dropping coasters, thrill rides, and water slides that you may expect. 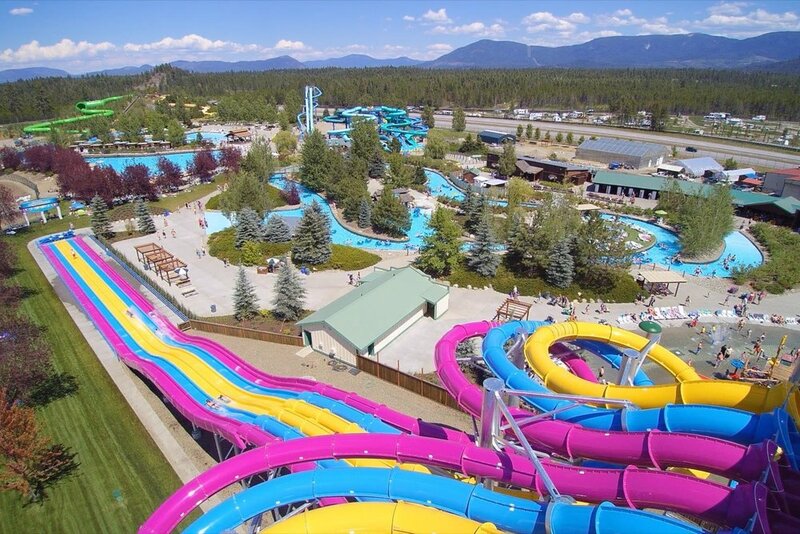 Located just outside of picturesque Coeur d’Alene, Idaho, admission here is for both parks; there’s no discount for only visiting the water park. That being said, tickets are reasonably-priced, considering the size. And while the amusement park has plenty of rides for little ones, the water park is much more geared to ages 6 and up. 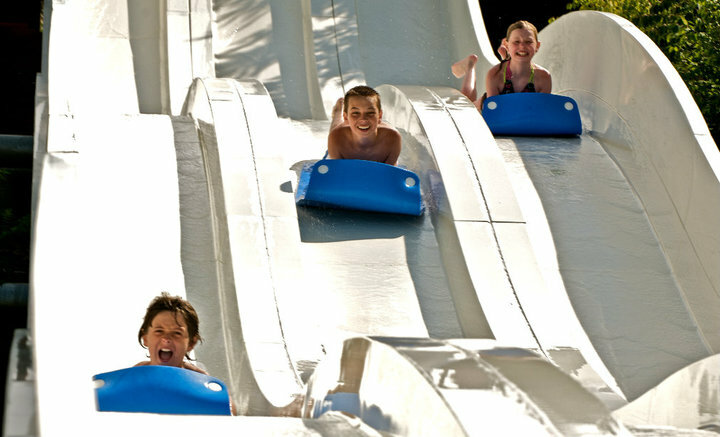 To ride any of the major slides, your kids need to be at least 42-inches tall, and in some cases, 48-inches. If you have a toddler or preschooler, I’d recommend postponing a trip to Boulder Beach. The slides here are first-class. Your kids will love Avalanche Mountain and Ricochet Rapids, both family raft slides, mostly because they can watch the look of terror on your face! 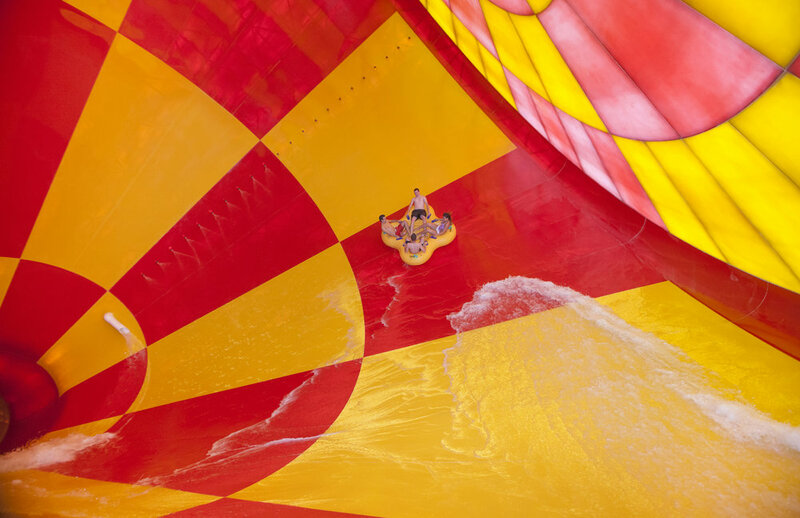 In addition to the obligatory lazy river, the park has six side-by-side racing slides that stand at nearly 60 feet. You ride these slides on a mat, face first - not my favorite - but kids don’t seem to mind. Both parks are beautifully landscaped, well maintained, and impeccably clean. However, Boulder Beach does lack shade. You may want to consider a cabana rental. At $135/day, it’s a bit spendy, but it does include towels, two tubes, a mini fridge, and a secure locker. You’ll want to rent the cabana in advance online; I’d suggest opting for one close to the second wave pool for more shade. KidTripster Tip: In addition to all the stomach-plunging rides in the theme park, don’t miss the magic show. Seriously. It’s a must! And the 30-minute train excursion is unique with a Sasquatch sighting, herd of real bison, and a robbery. I can’t stress this point enough; I would not go to Silverwood and Boulder Beach on a summer weekend. Period. Why? The lines are ridiculously long, in large part due to inadequate staffing. And I’m not talking about just the rides; you’ll wait in a 45-minute-long line to buy a slushie! And because both Silverwood and Boulder Beach don’t open until 11 a.m. (way too late in my opinion), getting there when the gates fly open doesn’t seem to matter, though you’ll want to be there even before opening to snag a parking spot that doesn’t require a hike. Finally, know that the water here is not heated; it’s “refreshing” (read: icy). Surprisingly, the water park allows both smoking and drinking. Adults can purchase alcoholic beverages from the bar and then bring those drinks into the lazy river to sip as they float. And smoking is allowed everywhere with the exception of the non-smoking cabanas that I spotted in the rear of the park. Summer season cost: Youth (2 & under) Free; Youth (3-7) $25-$28; Other $48-$51; discounts available for 2-day admission, after 5pm admission, and Bounce Back Admission (tickets purchased in park to return the following day). The park is also open on weekends during May and some dates in September. Check the calendar in advance. KidTripster Tip: You also can save a few bucks by purchasing tickets in advance online instead of buying them at the gate. If you’re staying at the Silverwood RV Park, you’ll receive the biggest discount, but tickets must be purchased in the campground store. The park does allow you to bring in your own food and drink; to avoid the lines, that’s your best option. However, if you do need to eat in the park, hit up Chuckwagon John’s all-you-can-eat BBQ buffet. Cost: Youth (7 & under) $5.99; Adult $12.99. To take full advantage of the parks, I’d recommend staying at the Silverwood RV Park with both tent and full-hookup RV sites. The campground is within walking distance to the parks via a tunnel that goes under the highway. Considerably smaller than Wild Waves and Boulder Beach, Slide Waters is perfectly-sized for younger water park enthusiasts. The park overlooks Lake Chelan in north-central Washington state and is well-designed with a spacious, zero-entry lazy river and plenty of shaded spaces to escape the sun, though this is the Pacific Northwest, where we soak up all the summer sun that we possibly can! This park is a great first-time experience for little ones. Toddlers and preschoolers are sure to enjoy the Aqua Zoo play area and the mini slides. They can even tackle some of the larger slides in the lap of their parents. Older kids will gravitate toward the racers, where riders can compete for bragging rights. Plus, the family hot tubs and beach volleyball courts are a nice addition. Lines are doable here; of course, it is busier on the weekends. The park does allow you to bring in your own food or your can grab typical park fare. If you’ve got thrill-seeking teens, this park isn’t for you. While they likely will enjoy the tube slides and lazy river, it’s simply not enough to keep their interest, especially with no wave pool. KidTripster Tip: Attendants will ride you about wearing glasses of any sort on the slides. Eyeglasses and sunglasses must have a strap, which you can buy at the gift shop. Cost: Youth (under 48”) $17; Adult (over 48”) $22; discounts after 4 p.m.
Orion Ludlow is a Portland, Oregon-based journalist, forest ninja, and father to a 3-year-old daughter. In his earlier days, he surveyed mountainous wilderness for endangered snails, caught 4,000 albacore tuna by hand, and was the fastest pizza delivery driver in his hometown. Thrilling tales to be sure, but nowhere near as awesome as adventure time with his wife and kid. This writer received some complimentary admissions for the purpose of this review. However, all opinions expressed are solely his own.